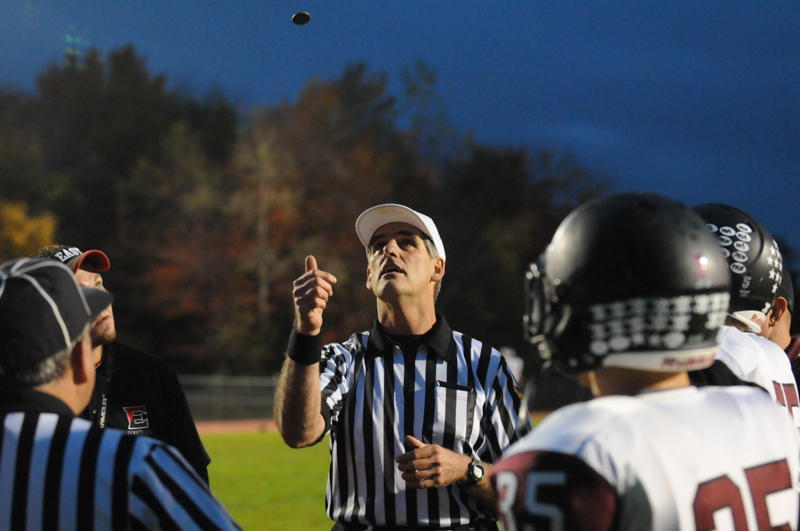 Before a high school football game, the referee flips a coin to determine who will first receive the ball to start the game. This happens just after the Friday night warmups in my area, so the gathering at midfield just before kickoff is merely ceremonial. The actual coin toss occurs even before the pre-game activities, including the marching band’s performance. Inspired by Peter Read Miller’s book, On Sports Photography, (which really is a great sports photography book) I wanted to make an attempt at photographing the coin toss last Friday night. You’ve got to check out his coin toss photo in his book captured at the Dallas Cowboys’ Stadium! As most of you know, lighting at these high school games is not typically very good nor very bright. However, this is not an action shot, so I thought I might get something decent even with the thin lighting. The coin toss began with a few words from the referee and then the shaking of the hands of both teams. It is more like an amoeba conglomeration of people and I had to keep an eye on a videographer, too. This is the shot I ended up with during Friday night’s coin toss. It is okay at best; certainly not stellar. The one good thing is the coin is in the with that dark blue sky and the referee is looking up at it. The main problem is the lack of any other faces being visible in the shot. The one almost face is obscured by the other official. I am thinking I should use a wider angle lens the next time and certainly get into a better position to capture the faces of the players. I am learning!